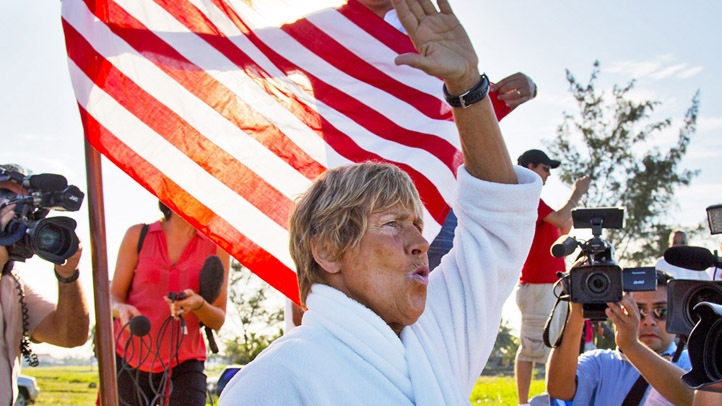 Diana Nyad: "I Believed in Dreaming Big"
A day after completing her historic Cuba-to-Florida swim, endurance swimmer Diana Nyad said making the journey was the fulfillment of a "big dream." "All my life, I don't know where it came from, I believed in dreaming big," Nyad said during a news conference in Key West Tuesday. "It doesn't satisfy me to have small dreams and I can't tell you what a big, big dream this is out here. It's tough stuff." Nyad, 64, took time out to thank her team, which helped her complete the swim Monday afternoon. "Never ever, ever could I do this without this team right here," Nyad said. "We came across like a professional, well-oiled machine." Nyad finished the historic swim just before 2 p.m. Monday, coming ashore at Smather's Beach in Key West to the applause of hundreds of spectators. She had left Cuba just before 9 a.m. Saturday to begin her fourth attempt to make the swim without a shark cage. "Never ever give up," Nyad told the crowd Monday as she walked out of the water was helped onto a stretcher and given an IV by medical workers. "You're never too old to chase your dreams." On Tuesday, Nyad spoke about the significance of beginning the swim in Cuba. "Any of us who are in this area of the world certainly know the mystique of Cuba but all around the world, people know that place and those people and since 1959, basically we haven't been allowed to go there and they're not allowed to come here," Nyad said. "It's a beautiful, intelligent, artistic, athletic poetic people and we all know that many people have died on the way over trying to get out from there swimming." Nyad said the people on shore who greeted her inspired her. "It was people who were recognizing what we all go through in our lives, we all have dreams and we all get disappointed, we all have heartache and we suffer and we work to get through it, it's just the human condition," she said. "What I saw on those peoples' faces was, 'you didn't give up.' That's what I need to hear, I need to witness somebody who, as difficult, as impossible as it seems, just would not give up." The swimmer was feted with a small parade in Key West Tuesday evening. Spectators applauded Nyad as she rode in a convertible down Duval Street and through Key West's Old Town, the Florida Keys News Bureau reported. A Conch Tour Train carried her support team. Earlier Tuesday, Nyad recounted the physical and mental obstacles she faced throughout the 53-hour swim during an appearance on NBC's "Today Show," saying she was "sick as a dog and "vomiting constantly" during the harrowing journey. "All marathon swimmers and mountain climbers and extreme endurance people have songs and chantings and countings, but I tell you the truth, with all the experience I have, especially with this ocean, I didn't realize how much suffering there was going to be," Nyad said. "It was very wavy, I got very lucky with the gulf stream, it was going right where I was going so that saved me." Nyad also talked about her previous failed attempts and why the latest one was different. "I feel all right; it's amazing how the emotional can lift the physical, I remember the feeling only too well right here in Key West the last few years not making it," she said. "I felt pretty beat up and sore and down and tired but to see that beach, to see those people, and to come in with my intrepid crew, it just takes all the physical pain away." Nyad said one of the main obstacles was jellyfish but she had the help of a jellyfish expert of the successful swim. "I had the box jellyfish expert of the world with me, before we just went out saying 'oh my God, hope we get lucky and make it through,'" Nyad said. "The animals are the most deadly in the ocean, so she was there every minute, diving around me saying 'they're not in the water right now.'" Nyad said a special mask that was designed to protect her from the jellyfish made swimming more difficult. "Very difficult to swim in; I took in a lot of saltwater and now I've got huge abrasions, lesions all in the mouth from the mask rubbing," Nyad said. "But the jellyfish, I decided, the resolve was so strong to make this swim that I had to get through them. It's their world and I had to get through them." The effects from the mask also made it harder to eat out at sea, she said. "The jellyfish mask made me take in a lot of saltwater so I was sick as a dog, and we couldn't, my crew couldn't find anything for me to eat or drink that I could keep down," she said. "I was vomiting constantly, almost throughout the whole 53 hours and you know, you don't have strength anymore, so I wasn't out there just kind of swimming and daydreaming like usual, I was dealing with a crisis." Earlier Tuesday, Florida Gov. Rick Scott called Nyad to congratulate her. "I thanked Diana today for making Florida a part of her historic milestone. She is an inspiration for so many. I told her Florida was proud to be her monumental finish line yesterday," Scott said in a statement. "I also asked Diana to consider staying in Florida for a while and even calling our great state home again. Florida is home for many dreamers, entrepreneurs and those that continue to make history – just like Diana." At the news conference, Nyad said she has plans for other swimming events, including a 48-hour swim in New York next month, and said her age isn't holding her back. "I don't wake up feeling like I'm 64 years old; I just wake up and bound out and grasp the next day," she said. "I think I'm truly dead center in the prime of my life."